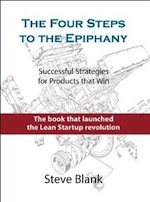 Five years ago we brought evidence-based entrepreneurship to Life Sciences – teaching the first Lean Lean Launchpad class at UCSF, then the NIH and Imperial College. But it’s been awhile since I was in a room made up entirely of Life Science entrepreneurs. So I was excited to visit IndieBio, a life science accelerator in San Francisco. Think of IndieBio as “Y-Combinator for Life Sciences with a wet lab” and you get what they are trying to do. It’s a 4-month program to help biotech startups build their company and it comes with $250k in seed funding. I sat down with Arvind Gupta, Founder and Managing Director of IndieBio and talked about how Lean methods apply to Life Sciences. 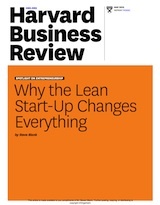 The first half of the conversation talks about Lean and its origins. The second half focuses on its applicability in Digital Health and Life Sciences. Every year I head to the East coast for vacation. We live in a semi-rural area, just ~10,000 people in town, with a potato farm across the street and an arm of the ocean in the backyard. While they own tech, smartphones and computers, most of my neighbors can’t tell you about the latest trends in AI, Bitcoin or Facebook. In contrast, Silicon Valley is an innovation cluster, a monoculture of sorts, with a churning sea of new tech ideas, sailed by entrepreneurs who each passionately believe they’re the next Facebook or Google, with their sails driven by the hurricane winds of investor capital. The seas are calm here. Most years out here I spend my time reading. This year has been a bit more interesting. One of the things I did was to speak to the startup community in Providence Rhode Island at Brown University. 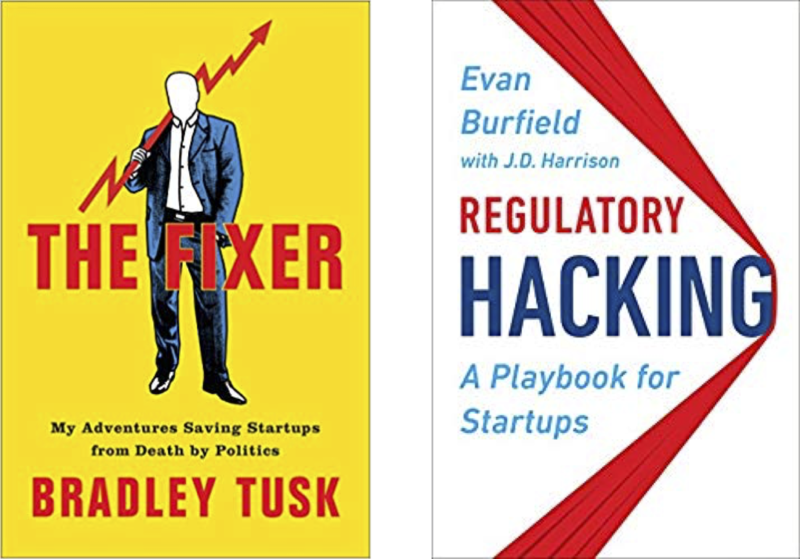 26:42: How we changed the way science is commercialized in the U.S.
Is your organization full of Hackathons, Shark Tanks, Incubators and other innovation programs, but none have changed the trajectory of your company/agency? Over the last few years Pete Newell and I have helped build innovation programs inside large companies, across the U.S. federal science agencies and in the Department of Defense and Intelligence Community. But it is only recently that we realized why some programs succeed and others are failing. After doing deep dives in multiple organizations we now understand why individual innovators are frustrated, and why entrepreneurial success requires heroics. 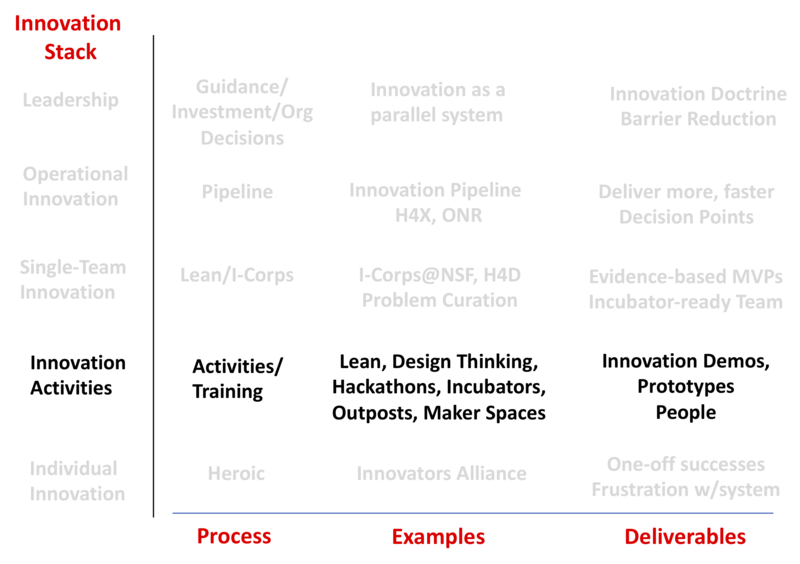 We also can explain why innovation activities have generated innovation theater, but few deliverables. 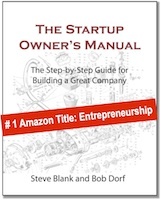 And we can explain why innovation in large organizations looks nothing like startups. Most importantly we now have a better idea of how to build innovation programs that will deliver products and services, not just demos. It starts by understanding the “Innovation Stack” – the hierarchy of innovation efforts that have emerged in large organizations. The stack consists of: Individual Innovation, Innovation Tools and Activities, Team-based Innovation and Operational Innovation. The pursuit of innovation inside large companies/agencies is not a 21st-century invention. Ever since companies existed, there have been passionate individuals who saw that something new, unplanned and unscheduled was possible. And pushing against the status quo of existing process, procedure and plan, they went about building a demo/prototype, and through heroic efforts succeeded in getting a new innovation over the goal line – by shipping/deploying a new innovation. We describe their efforts as “heroic” because all the established procedures and processes in a large company are primarily designed to execute and support the current business model. From the point of view of someone managing an engineering, manufacturing or operations organization, new, unplanned and unscheduled innovations are a distraction and a drag on existing resources. 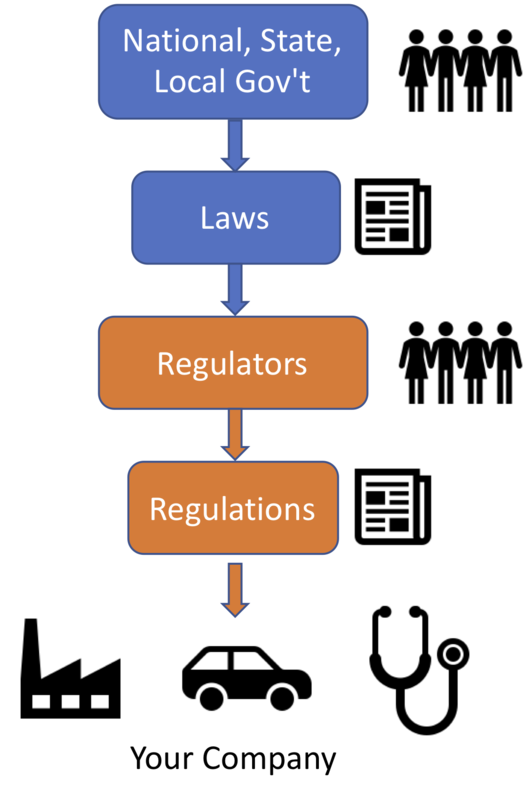 (The best description I’ve heard is that, “Unfettered innovation is a denial of service attack on core capabilities.”) That’s because until now, we hadn’t levied any requirements, rigor or evidence on the innovator to understand what it would take to integrate, scale and deploy products/services. 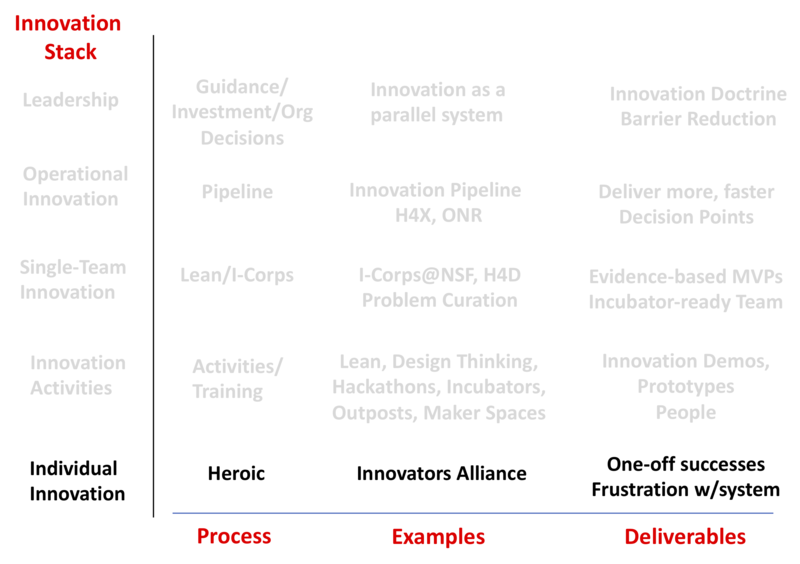 Finally, most corporate/agency innovation processes funnel “innovations” into “demo days” or “shark tanks” where they face an approval/funding committee that decides which innovation ideas are worth pursuing. However, without any measurable milestones to show evidence of the evolution of what the team has learned about validity of the problem, customer needs, pivots, etc., the best presenter and flashiest demo usually win. In some companies and government agencies, innovators even have informal groups, i.e. an Innovators Alliance, where they can exchange best practices and workarounds to the system. (Think of this as the innovator’s support group.) But these innovation activities are ad hoc, and the innovators lack authority, resources and formal process to make innovation programs an integral part of their departments or agencies. Over the last decade, innovators have realized that they needed tools and activities different from traditional project management tools used for new versions of existing products/customers.They have passionately embraced innovation tools and activities that for the first time help individual innovators figure out what to build, who to build it for and how to create effective prototypes and demos. Some examples of innovation tools are Customer Development, Design Thinking, User-Centric Design, Business Model Canvas, Storytelling, etc. Companies/agencies have also co-opted innovation activities developed for startups such as Hackathons, Incubators, internal Kickstarters, as well as Open Innovation programs and Maker Spaces that give individual innovators a physical space and dedicated time to build prototypes and demos. In addition, companies and agencies have set up Innovation Outposts (most often located in Silicon Valley) to be closer to relevant technology and then to invest, partner or buy. These activities make sense in a startup ecosystem (where 100% of the company is focused on innovation,) however they generate disappointing results inside companies/agencies (when 98% of the organization is focused on executing the existing business/mission model.) While these tools and activities educated innovators and generated demos and prototypes, they lacked an end-to-end process that focused on delivery/deployment. So it should be no surprise that very few contributed to the company’s top or bottom line (or an agency’s mission). Rather than just teaching innovators how to use new tools or having them build demos, we recognized that there was a need for a process that taught all the components of a business/mission model (who are the customers, what product/service solves their problem, how do we get it to them, support it, etc.) The next step in entrepreneurial education was to teach teams a formal innovation process for how to gather evidence that lets them test if their idea is feasible, desirable and viable. Examples of team-based innovation programs are the National Science Foundation Innovation Corps (I-Corps @ NSF), for the Intelligence Community I‑Corps@ NSA, and for the Department of Defense, Hacking for Defense (H4D). In contrast to single-purpose activities like Incubators, Hackathons, Kickstarters, etc., these curricula teach what it takes to turn an idea into a deliverable product/service by using the scientific method of hypothesis testing and experimentation outside the building. This process emphasizes rapid learning cycles with speed, urgency, accepting failure as learning, and innovation metrics. Teams talk to 100+ beneficiaries and stakeholders while building minimal viable products to maximize learning and discovery. They leave the program with a deep understanding of all the obstacles and resources needed to deliver/deploy a product. The good news – I-Corps, Hacking for Defense and other innovation programs that focus on training single teams have raised the innovation bar. These programs have taught thousands of teams of federally funded scientists as well as innovators in corporations, the Department of Defense and intelligence community. However, over time we’ve seen teams that completed these programs run into scaling challenges. Even with great evidence-based minimal viable products (prototypes), teams struggled to get these innovations deployed at scale and in the field. Or a team that achieved product-market fit building a non-standard architecture could find no way to maintain it at scale within the parent organization. Upon reflection we identified two root causes. The first is a lack of connection between innovation teams and their parent organization. 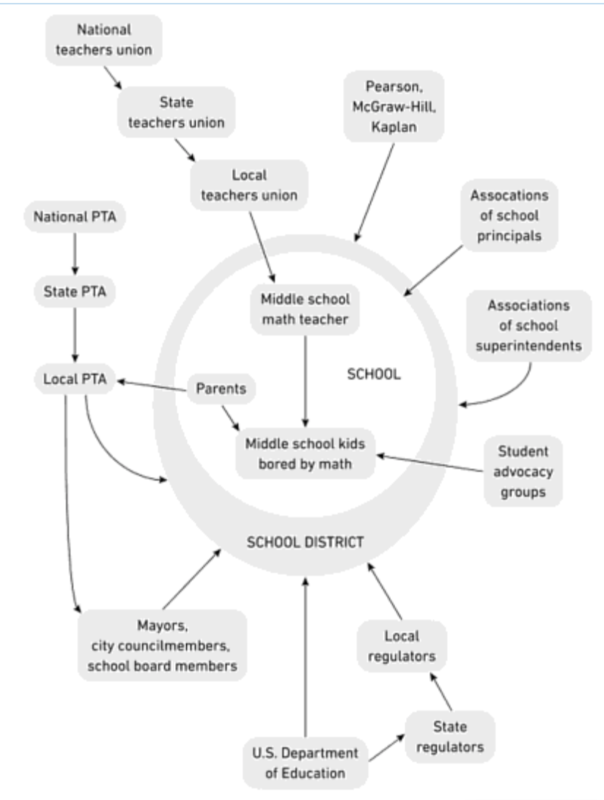 Teams form/and are taught outside of their parent organization because innovation is disconnected from other activities. This meant that when teams went back to their home organization, they found that execution of existing priorities took precedence. They returned speaking a foreign language (What’s a pivot? Minimum viable what?) to their colleagues and bosses who are rewarded on execution-based metrics. Further, as budgets are planned out years in advance, their organization had no slack for “good ideas.” As a result, there was no way to finish and deploy whatever innovative prototypes the innovators had developed – even ones that have been validated. As organizations have moved from – individual innovators working alone, to adopting innovation tools and activities, to teaching teams about evidence-based innovation – our most important realization has been this: Having skills/tools and activities are critical building blocks but by themselves are insufficient to build a program that delivers results that matter to leadership. It’s only when senior leaders see how an innovation process can deliver stuff that matters – at speed—that they take action to change the processes and procedures that get in the way. We believe that the next big step is to get teams and leaders to think about the innovation process from end-to-end – that is to visualize the entire flow of how and from where an idea is generated (the source) all the way to deployment (how it gets into users’ hands). So, we’ve drawn a canonical innovation pipeline. (The HBR article here describes it in detail.) 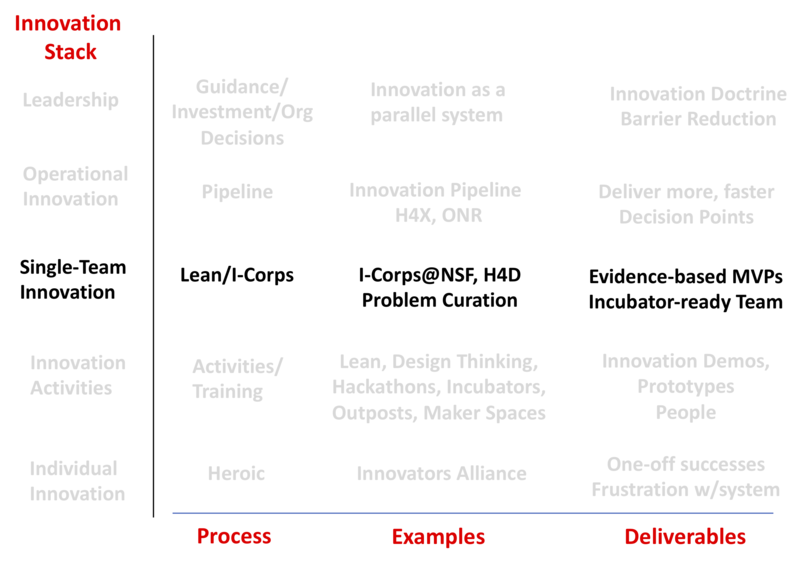 For context, in the figure below, the I-Corps program described earlier is the box labeled “Solution Exploration/Hypotheses Testing.” We’ve surrounded that process with all the parts necessary to build and deliver products and services at speed and at scale. Second, we’ve realized that while individual initiatives won “awards,” and Incubators and Hackathons got coffee cups and posters, senior leadership sat up and took notice when operating groups transformed how they work in the service of a critical product or mission. When teams in operating groups adopted the innovation pipeline, it made an immediate impact on delivering products/services at speed. An operating group can be a corporate profit and loss center or anything that affects revenue, profit, users, market share, etc. In a government agency it can be something that allows a group to execute mission more effectively or in a new disruptive way. Operating groups have visibility, credibility and most importantly direct relevance to mission. Where are these groups? In every large company or agency there are groups solving operational problems that realize “they can’t go on like this” and/or “we need to do a lot more stuff” and/or “something changed, and we rapidly need to find new ways to do business.” These groups are ready to try something new. Most importantly we learned that “the something new” is emphatically not more tools or activities (design thinking, user-centric design, storytelling, hackathons, incubators, etc.) 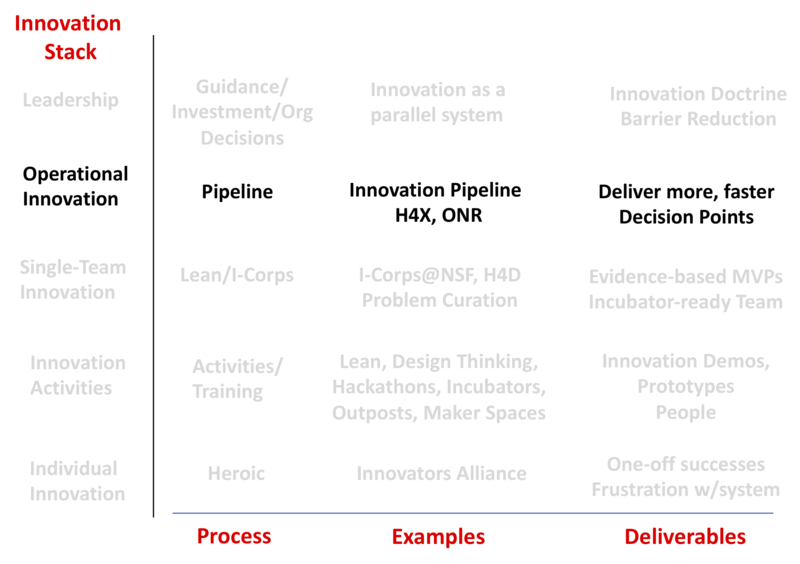 Because these groups want an end-to-end solution, the innovation pipeline resonates with the “do’ers” who lead these groups. However, without a mandate for actually delivering innovation from senior leadership, scaling innovation across the company/agency means finding one group at a time – until you reach a tipping point of recognition. That’s when leadership starts to pay attention. Our experience to date is that 25- to 150-person groups run by internal entrepreneurs with budget and authority to solve critical problems are the right place to start to implement this. Finding these people in large companies/agencies is a repeatable process. It requires patient and persistent customer discovery inside your company/agency to find these groups and deeply understand their pains/gains and jobs to be done. 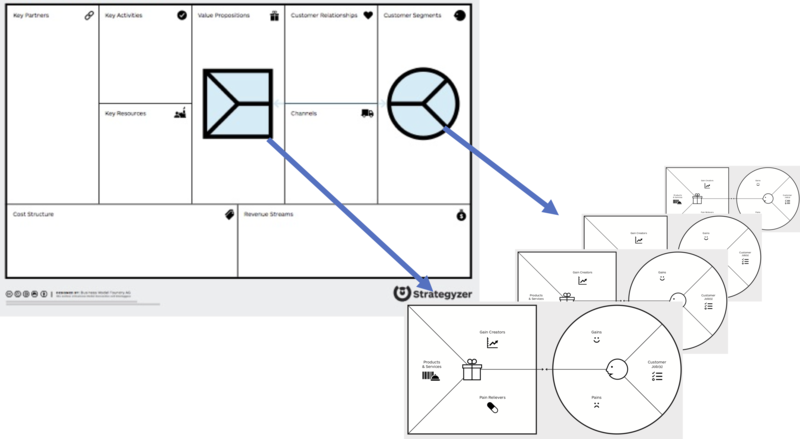 Lean, Design Thinking, User-centric Design, Business Model Canvas, etc. Hackathons, Incubators, Kickstarters, I-Corps, FastWorks, etc.